Mom and dad have been working very hard lately, keeping me in bones and dog toys. So to decompress, the three of us took off last weekend for the Central Coast. 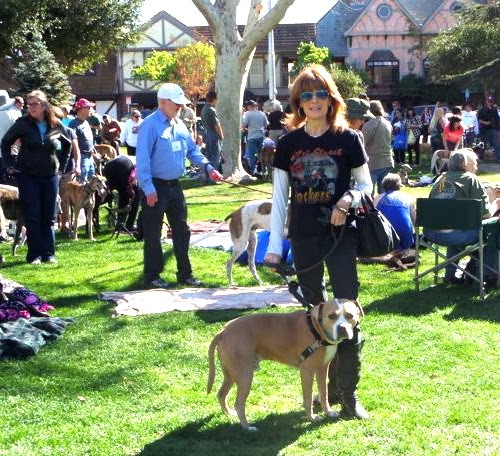 The ostensible reason was the 14th Annual Solvang Greyhound Fest. Billed “The Danish Capital of America,” One weekend every year, the town (renowned for its quaint, European-style architecture and decadent bakeries) puts out the Danish ‘Welcome’ mat for former racing dogs and their human adoptive parents. Over the course of two days, we saw hundreds of the sleek rocket hounds. I invited them all to play but only a few of the youngsters answered the call. At first I thought the leggy divas were just too full of themselves but then some rescue folks explained that Greyhounds spend their early lives in kennels, surrounded by only their handlers and other Greyhounds. Not surprisingly, they tend to view other dogs, even this lovable Pit Bull, as an alien species. At least no one complained about having a ‘gangsta’ pit bull crash the party. Whenever someone did ask about my lineage, Lou would say, “Tanner’s a Greyhound that’s been hitting the weights and taking ‘roods”. 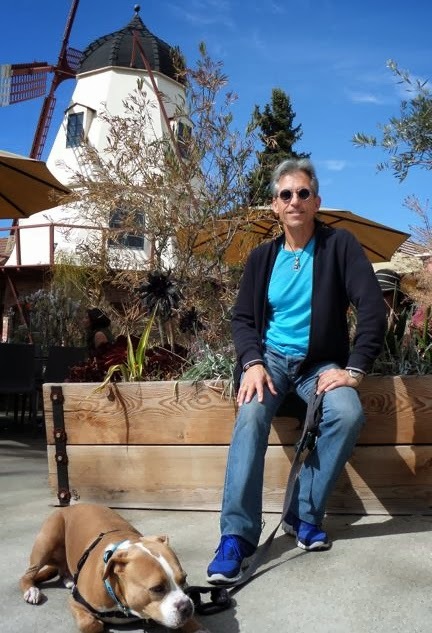 In addition to ogling dogs, we took the opportunity grab some fine eats at La Super Rica in Santa Barbara,The Hitching Post in Buelton and Root 246 in Solvang. Every year, the three of us put our heads together to pick the Oscar winners. Lou thinks he’s the expert, but mom and I took him to school in 2012 when Uggie led The Artist to a Best Picture win. Thanks to SAG screeners, we managed to see most of this year’s nominees and here are our predication: Best Director: Alfonson Cuaron for Gravity. Best Picture: Dallas Buyers Club, with Best Actor and Best Supporting Actor nods Matthew McConaughey and Jared Leto. Kate Blanchett cops Best Actress for Blue Jasmine, while Jennifer Lawrence of American Hustle grabs her second golden dwarf for Best Supporting Actress. Finally, Best Screenplays to 12 Years A Slave (Adapted), and Dallas Buyers Club (Original). Speaking of awards….A few weeks back, the American Kennel Club held its 138th Westminster Dog Show at New York’s Madison Square Garden. We watched both nights and felt that the American Staffordshire Terrier was clearly the pick of the blue blood litter. In case you’re wondering, our choice had nothing to do with the fact that I’m an AmStaff. We also liked the Pug (for Dudley) the Irish Setter (for Rebel) and the Miniature Bull Terrier (for Maynard). 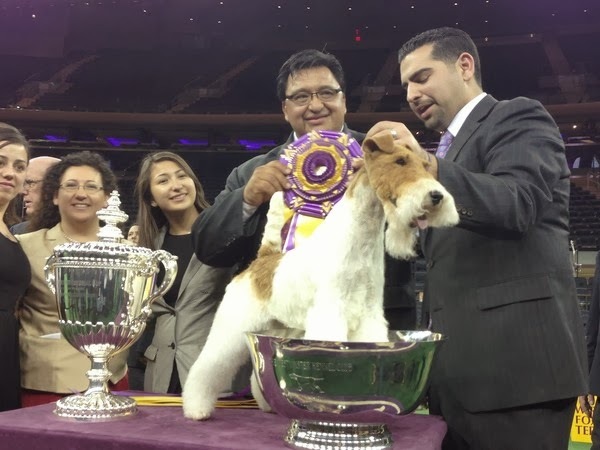 The crowd went gaga for Nathan, a goofy Bloodhound but, in the only pick that mattered, the Judge selected ‘Sky’ a wire haired Fox Terrier, as this year’s top dog. Disappointed as we were, we were happy for Sky, who’s a hometown Malibu dog.